One part of the film that fans won’t forget is the appearance by the hero of the original Knight Rider series, Michael Knight (David Hasselhoff). Plans are currently underway to bring Michael back to the series — and he might bring a certain four-wheeled friend with him. 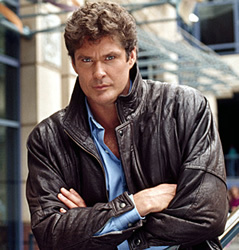 Should Hasselhoff appear in the new series? Nah. It's a new series. The executive producer also shared that he has a dream scenario in mind — Mike Tracer (Justin Bruening) and the new K.I.T.T. (voiced by Val Kilmer) teaming up with Michael Knight (Hasselhoff) and the original KITT (voiced by William Daniels). Whether this on-screen partnership will happen will happen or not will all come down to timing, Thompson says. It still remains to be seen how long the new Knight Rider series will last. Unlike the pilot movie, there hasn’t been much buzz about the new series. That may actually be a blessing considering how it became nearly impossible for last year’s over-hyped Bionic Woman to live up to expectations. Will the new series about a man and his high-tech machine continue for many years to come or, quickly run out of gas? Stay tuned! “Mike Tracer” or perhaps it was Justin Bruening was a total twit in the movie, ideally he’d be recast and rewritten for a series.